The Goddard School believes in the power of play for learning, as well as the importance of providing a healthy, active lifestyle for all children. In an effort to spread the word to families in their community, the educational preschools will sponsor The Goddard School Block Party event from Monday, September 19 through Saturday, September 24, 2011. The event will engage children and their families in a variety of exciting fitness, nutrition and playful learning activities based on the core curriculum and enrichment programs that are an integral part of the FLEX™ Learning Program offered at The Goddard School. In addition to The Goddard School Block Party event taking place in our Schools, Goddard Systems, Inc. (GSI), franchisor of The Goddard School, is the exclusive preschool sponsor of Play for Tomorrow’s Ultimate Block Party: The Arts and Sciences of Play, a powerful global movement designed to recognize and celebrate the power of play for learning. The Ultimate Block Party will take place Sunday, October 2nd, at Rash Field in Baltimore’s Inner Harbor in downtown Baltimore, MD and will feature an amazing day of play for families and children, designed to bring playful learning back to the forefront. At the event, GSI and the Baltimore-area Goddard Schools will host the Let’s Play Café. Children will enjoy manipulating play dough, shopping at a pretend farmer’s market and participating in a series of engaging pretend restaurant activities while learning about nutrition, counting, sorting and other important lessons through play. Make it into a game. Create a game out of everyday tasks such as chores, cleaning and gardening. Think outside the box to create activities that are active and stimulate the mind. Play helps children learn to solve problems, promotes flexibility and motivation, teaches regulation of emotions and builds resilience and confidence. Get outside. Preschoolers need plenty of time and space to run around and play. Taking your child to a playground or park is a great way to release energy and exercise! Play outside with your child and teach hand-eye coordination by showing the basics of throwing, catching and kicking a large, soft ball. Add music to the activity. Play “Statues” by playing up-tempo music. Have your child move while the music is playing and freeze into a statue when you pause the music. Encourage creative dancing. Be active with your children. 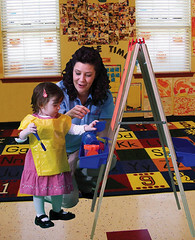 Support young toddlers’ mastery of walking by allowing them to be active! Play with them as they learn to run, hop, dance and throw. Have them chase bubbles or invent a silly walk — play becomes exercise. Remember to provide encouragement to your child as they build self-confidence. Get active inside, too. When weather interferes, get out the large balls, exercise mats and Twister® games, or do some stretching and balancing exercises together. Limit TV, video game and computer time to encourage your children to become active. To learn more about The Goddard School Block Party and The Goddard, parents are encouraged to visit www.goddardschool.com/blockparty or call 1-800-GODDARD. The Goddard School and Goddard Systems, Inc. is a proud sponsor of the Ultimate Block Party: Arts and Sciences of Play. Watch this video to see The Goddard School Let’s Play Cafe and participation in the largest game of Simon Says (with Goddard Schools across the nation!). To watch more videos from The Goddard School, click here! Play for Tomorrow’s Ultimate Block Party is coming, and The Goddard School hopes that it will change the way you think about play forever. In a national event on October 3 in the Bandshell area of New York City’s Central Park, and in Mini Block Parties at Goddard Schools nationwide during the preceding week, the organizing team, Play for Tomorrow, will join forces with The Goddard School and non-profit organizations, government agencies and large corporations to kick-off a powerful new, global movement designed to recognize and celebrate the power of play for learning. Play for Tomorrow is the consortium behind the “playful learning” movement. The Ultimate Block Party is the premier event in a national education movement, co-founded by Kathy Hirsh-Pasek, Ph.D, Professor of Psychology at Temple University in Philadelphia, who believes that how we play as children helps us succeed in school and shapes who we become as adults. “The workforce of 2040 is in our preschools today,” says Dr. Hirsh-Pasek, “and we must ensure that, as a nation, we are well equipped to thrive in our global economy.” Together with its partners, Play for Tomorrow is committed to building a public groundswell for the importance of play in fostering lifelong learning and to help enact change in policy and education. “The Goddard School has been selected as the exclusive national preschool sponsor of Ultimate Block Party because of its long-standing commitment to the importance of play in early childhood education,” states Adair. As an activity sponsor at the Central Park event, and in Mini Block Parties ranging from a single day to a full week at individual schools, Goddard will invite children and families to join in fun-filled, playful learning activities designed to make learning an engaging and hands-on experience. Parents will also ask their children to take a “Play Pledge” that states, “We believe in the Power of Play. Our family pledges to encourage playful learning. We recognize that play helps children explore and discover and is the foundation of creative and confident learning.” Beginning September 2, families also can take the “Play Pledge” on Goddard Schools’ Facebook, and download The Goddard School Play Along Song and helpful play tips by visiting www.goddardschool.com/blockparty.